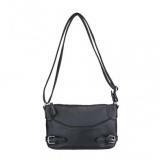 Cross body Bag- Black, CCW handbag with multiple compartments to secure the included universal holster. Faux leather Cross body Bag with a pocket on the front of the purse with a magnetic snap-button closure. The CCW holster is located in the main zippered compartment of the purse. The bag features an adjustable shoulder strap. Large center zippered compartment that is split into two separate sections and the center divider features a zippered pocket. One side features a loop fastener patch for a holster with hook fasteners and the other side has a zippered side internal pocket.